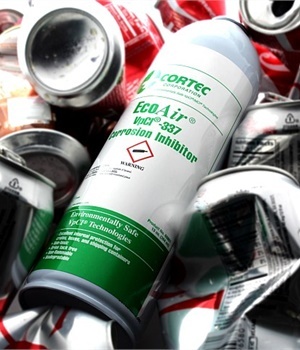 The EcoAir VpCI-337 Fogger is designed to provide corrosion protection in a spray can. On its own, VpCI-337 is a biodegradable waterborne vapor corrosion inhibitor used to protect metal parts and internal void spaces with a thin, environmentally friendly, self-healing film. Vapor phase Corrosion Inhibitors (VpCIs) in the fluid migrate and protect metal surfaces, which can reportedly result in time and cost savings and using a minimum amount of product. The product is packaged in a recyclable EcoAir can using bag-on-valve technology. According to the company, EcoAir cans are powered by compressed air and can be sprayed in any direction without releasing solvents, VOCs, or aerosols into the atmosphere. EcoAir VpCI-337 can be transported for use without the need for electricity or special spray equipment. When the can is empty, users can pop the top off, remove the inner bag, and throw the remaining aluminum can directly into the recycling bin.